ISO 45001 training for auditors – online course now fully approval by IOSH (December 2018). Learn in your own time. The AuditMentor ISO 45001 Auditor Course is a brand-new training package offering fully approved, online training on the ISO 45001 standard. The course provides clear, expert guidance on the ISO 45001 standard and the requirements of performing an audit. 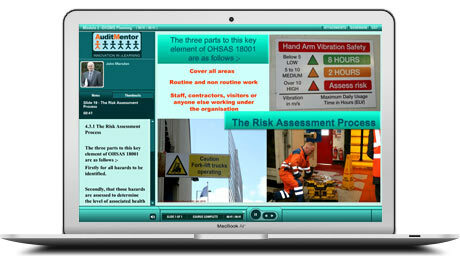 Featuring six multimedia modules, each one comprising of around 60 interactive slides, the course provides an enjoyable and effective training experience. Tracked quizzes are there to help you monitor your learning and are fed back to our support team – who will be with you every step of the way. Included in the package is our innovative online case study, where delegates are asked to write up a set of findings in a simulated audit environment. As well as online and telephone support, expert guidance is available from our course author John Marsden, a Fellow of IEMA and IRCA registered lead auditor with more than 20 years of experience of undertaking certification audits. “I am an experienced distance learner and can say that this auditor course is an excellent elearning program that accommodates various learning styles. The multi-media content contributed to making learning fun and effective and reflected the Tutor’s impressive knowledge and experience”. Module 1 – Introduction to the course. Why conduct an OHSMS audit? Our course provides excellent value-for-money as well as providing a truly excellent training experience – see our testimonials and related case studies. Once payment has been received, we will send you an invitation to the 6 modules that comprise this course. It’s easy and quick. If you are not sure, just send us an email and we will answer your questions.